"John gives realtors a good name. Unlike some agents, he is sincere, personable, genuine and always keeps his clients' needs and objectives as his priority. We worked with John over a period of several months as we searched for our first home in D.C. As a long time D.C. resident, he is highly knowledgeable and quick to offer reliable insights. He is aggressive when negotiating with sellers and other agents. We were thrilled to purchase our newly renovated townhouse at $20,000+ below the list price." -- Rachel L.
As a 25-year resident of Washington, D.C. and 13-year resident of Adams Morgan, John has a vested interest in the District and its surrounding areas and has first-hand experience buying, selling, financing and leasing in the region. 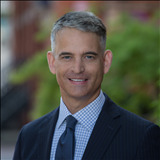 In addition to Adams Morgan, he has lived in Chevy Chase, Cleveland Park, Dupont Circle, Mount Pleasant and Penn Quarter and has worked in McPherson Square, Logan Circle and Northern Virginia. Born in Massachusetts and raised in New Hampshire, John received his Bachelor of Arts in English and Communications from Boston College. Prior to joining Coldwell Banker, he gained in-depth experience leading sales, marketing, public relations and corporate communications efforts at publicly-traded companies such as JPMorgan Chase, Convera and Teleglobe. This experience makes him a huge asset to his clients – he knows how to market and sell. 2426 Ontario Rd. NW - $799,000. 2 bed/2.5 bath/parking/2 private patios. 3573 S Stafford St. #A - $492,500. 3 bed/2 bath/parking/private patio. 5030 7th Pl. NW- $708,000. Newly renovated 4 bed/3.5 bath townhouse w/parking, front and back decks. 1313 Shepherd St. NW- $969,000. Newly renovated 5 bed/3.5 bath townhouse with 2 parking spots, front deck and back patio. Then secured renters for 2 units at $1900 and $3900 per month. 1724 6th St. NW- $981,000. 3 bed/2.5 bath townhouse with parking, front deck and private back patio. Check out our free, customizable Monthly Market Update Videos to see what's happening in the neighborhood where you live or are looking to live.